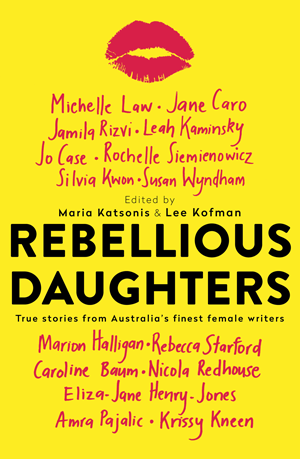 Rebellious Daughters is an anthology of essays by Australian female writers that explores rebellion, identity and the familial bond. Editors Maria Katsonis and Lee Kofman have curated a challenging and important collection of pieces. Although the stories are sometimes difficult to read – some truths hit too close to home – they are all relatable in some way. The essays vary in tone and shape, but each presents a touching honesty that calls for reflection by the reader on their own rebellious years. The stories explore the stereotypical acts of rebellion, like sneaking alcohol and wearing revealing clothing. But they are also introspective and explore rebellion as an act of self-preservation. Caroline Baum’s piece about being estranged from her parents is particularly striking. We’re sociologically programmed to value familial bonds above all else, and in Baum’s case it took strength to let go and step back from their toxic negativity. Recognising one’s parents as human is a recurring theme. Kofman’s tale of her visit to Sexpo with her mother is a great example of this; a trip that began as a childish revenge plot quickly turns into something revelatory and ultimately uplifting, thanks to her mother’s surprising glee at the risqué event. Forgiveness and regret also feature heavily. In ‘Pressing the Seams’, Leah Kaminsky solidifies her position as one of Australia’s most honest and talented writers. Her story in three parts details her relationship with her father, including a fateful trip through Israel together. It captures the awkwardness and vulnerability of youth and the tragedy that underscores her Jewish heritage. For me, the standout story was Eliza-Jane Henry-Jones’ ‘Just Be Kind’. A thoughtful meditation on kindness as a choice, the piece examines her relationships with her grandmother, mother and father, and the balance between kindness and truth. In one part of the essay she writes about her father’s substance abuse issues, and as someone who has had a similar experience, I personally connected with this essay. While selfishness is an important self-preservation tool, kindness has a far greater impact. The nature of anthologies is that some essays will appeal to readers more than others. It’s a risky game to critique how a person writes about their parents (a topic also explored in the anthology) but as a queer woman, I was uncomfortable with Nicola Redhouse’s description of her father’s homosexuality as a decision. It was also jarring to read that she felt that being around his friends was inappropriate, given that nothing beyond cross-dressing in a safe environment was described, but perhaps there is more to that section of the story. I appreciated the honesty of her piece and recognise that we won’t always feel about our parents in ways that make outsiders comfortable. While Rebellious Daughters gives voice to diverse writers, it could have included pieces from trans or otherwise genderqueer writers to more broadly explore women and daughters of all orientations and walks of life. All things considered, the collection is touching, challenging and celebratory. 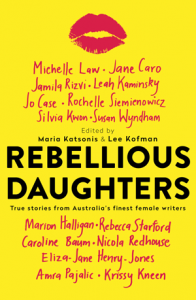 Women’s voices are still so often undervalued and underrepresented; Rebellious Daughters provides some antidote to this and will leave the reader with a long list of new authors to explore. This entry was posted in Arts, Books and tagged book review, books, feminism, lip lit, literature, memoir, relationships, women, writing. Bookmark the permalink.